I think a good fix for them would be to make Plague and Poison Javelin not reset boss Hp Regen. Hopefully it's possible to change this. The biggest problems I have noticed with their use is when people use Plague Javelin then run like hell or teleport and repeat. Poison Amazons can solo almost all of the LoS Bosses this way. Also it seems to be a feasible strategy against other bosses once twinked. Poison Amazons would be forced to atleast land Lightning Fury or another attack making it more difficult to use this hit and run technique to solo bosses. Making the Poison Amazon's require AR to hit seems a bit off to me considering the large amount of AR received by Strategy. Armageddon damage seems way too high. It could be cut in half in my opinion and still be reasonable Damage. Hurricane is also a bit too high in my opinion. I would lower the damage from it by 1/3rd. Same with Arctic Blast. FoH Paladin seems to be another Overpowered Solo Build. The Resistance Bypass seems to be too much. In my opinon it should be removed. 5. A Runeword Wand Weapon would be nice for a Melee Necromancer build. It would need a lot of Increased attack speed to be reasonable. Also some options from the unique wands would be nice. One That will reach the max frames for zeal would be great. They seem to be tank in a boots. Combined with Vampire Gaze or Bone Runeword Armor they give a 10k fast casting tank. This is very exploitable and can tank many tough bosses. They encourage soloing a great deal and seem very over-powered in my opinion. Not to mention the 0-skill bone Prison rivals a Necromance with all synergies maxed. In my opinion the 0-skill should be removed or at the very least lowered a great deal. I'll edit in a bit more. with the Poison Amazon its not the posion that resets the timer every second its the initial strike of the javelin i think? some good ideas overall, can we look at some of the other rare builds you dont normally see and try get them balanced and and inline so we have more builds and play options? I haven't really noticed any broken builds this ladder in my opinion. I've tried a ton of different builds this as well. Including: FoH Paladin, Poison Amazon, Mental Assassin, Bone Prison Necromancer, Throw Barbarian, Healer Paladin (Fanatacism + Conviction). Sanctuary Paladin, Magic Necromancer, Rabies Druid, Song Barbarian, Blaze Sorceress, Enchant Sorceress, Maul Druid, Summon Druid, Summon Necromancer, Cold Druid, Telekenisis Sorceress, Fire Druid, and Zeal Barbarian. They all seem to be reasonable Builds serving their intended purposes. Some better then others ofcourse but the only builds that seemed over-powered in my opinion I mentioned previously. I'm still kind of on the fence about the poison Amazon fix, maybe someone else has a better idea. Monsters' confuse should behave as a curse. It's quite enough penalty itself, and if you go for a CI build, you deserve to be really CI. If it affects necro's too, oh well, I haven't seen any necro use it. Make shrines' bonus work as confuse now if possible, that way they'll have some use. Full ci was stopped do to over powered barbs and droods back in 07.. These builds had no problem what so ever soloing the mod(Far more easier then the foher etc)..
yah slappy, i agree. i am not willing to nerf it to oblivion. 20-30% to start, or reduce synergies by a bit to get the same effect. I've been around a long time, and have seen TONS of changes in this mod. I'm definitely not against change, but after the fiasco with Blue's patch, I'm hesitant to make so many changes at once. Plague needs something to tone it down, but at the same time not punish venom/rabies/poison nova. I didn't mention poison strike due to the fact the necro has to be in a bosses face to do this damage, not standing a full screen away. 0skill lvl 33 prison on marrows is way too much, remove or reduce it to 0skill lvl 1 prison. As for putting 2 skills on these boots....no way. No other boots have more than 1 to all skills. They already add life replen and CBF. I personally loved the golem change to being able to have all 4 at once. With maxed mastery and plenty of +skills, each golem had their own niche. My favorite was physical attacks vs the iron golem. Iron golem has since been nerfed to nothingness. Back when he was good, you only need 1 point in amp to hit 90% phys reduction, now with 20 point into amp, you will hit mid 50's. This is itself is a huge nerf to the IG, but it didn't stop there. Thorns on the IG itself was then reduced by 2/3? Not sure the exact numbers, but when investing 20IG/20amp/20mastery, he should be able to damage a high physical attacking monster, and not have to rely on a merc. Dragon talon....oh were to start. The fact base damage of boots is so low, and the %ed from the skill is only 11% per point, makes this skill blow chunks now. I maxed talon on a sin back when ber runes gave 5% CB, and put a 31%CB caddy on her and kicked bosses at 2fpa. Now the skill has no niche. Anyone ever seen anyone use the skill? Didn't think so. I propose upping the ed per point to at least 15% from the 11% it is now, maybe even 20%. By leaving the base damage of the boots the same, Dtail won't get a buff...which it doesnt need. Increase the range of TK, since the high resolution change, TK won't even reach the edge of the screen. Sometimes no where near it. anybody have a recollection of what lvl 60 ig thorns used to be? Meet in the middle from 1.21z or something? If not I can probably calculate it..got the 1.21z files (well solo version) the other day. Kramuti, if you want them I have the 1.21 files both install and update. I should be able to dropbox both if you need. Allow crafted items to be re-rollable. Whether it would be a single hammer like for rares, or 3 hammers are created based on the tier of gem used. Not sure what a fair pricetag on it would be though. Increase ID book capacity to 100. Allow more than 1 MEGA potion to be bought from vendors that sell them. Allow class-specific items to be gamble-able. I think it's too late to make any new changes, but actually those are all things that have been brought up in the past by other people, not sure what the conclusion was on them though. I think it was Delta that had the idea of cubing crafts the same way you do unique rings. So cube 3 of the same crafted ring types and it will roll a new one. I think a hammer would be way too cheap. All you would need to do then is craft one thing, then sell p gems at vendor and infinitely roll the one thing. Allow crafted items to be re-rollable. Any cube recipe that results in a crafted item needs a unique set of inputs to determine what extra mods appear on the item, so we can't just use a glyph, hammer, or 3 crafted items of the same craft type because the cube won't know if you're after emerald-craft mods or something else. We could re-roll crafted items by copying their recipe and replacing "mag" (magic input item) with "crf" (crafted input item), while leaving everything else alone. It wouldn't be hard, but would take some time. The only benefit of this is that you wouldn't need to find a new magic base item, which might seem pretty nice to some folks. For the person implementing this change: consider copy-pasting the crafting rows into a new spreadsheet, then using Find-Replace-All (i.e. swap ",mag," with ",crf,"), and then adding them back to cubemain.txt. Due to hardcoded limitations, this appears only possible if the vendor has this type of potion in stock in Normal difficulty. I don't see a problem with that since the potions are level-limited. It would just look funny to see Akara selling such 1337 goods. Certainly would make it easier to find a magic item for crafting or get a particular set item, but might frustrate people because these would reduce the odds of other items appearing. Consider removing some entries from gamble.txt that people rarely want to gamble (the base items people rarely want to gamble, like armor, slow or low-damage weapons, etc (some community polls could be taken)). 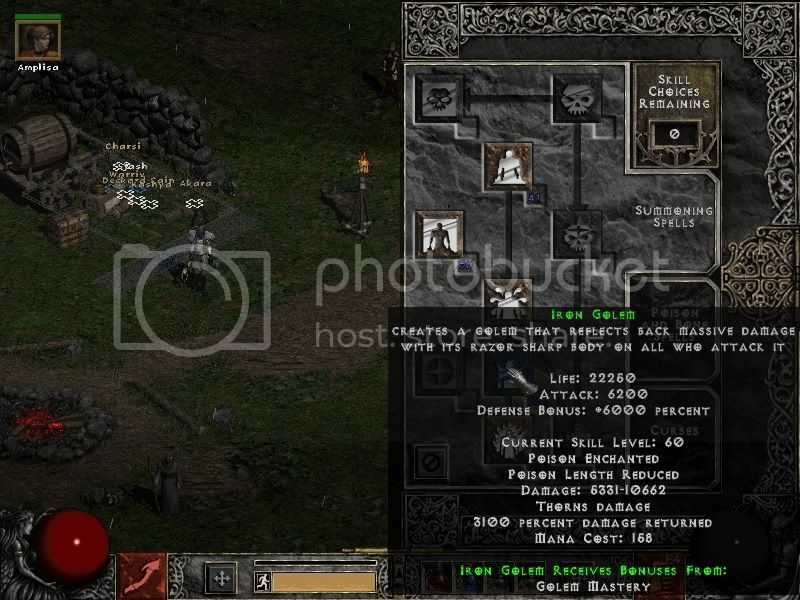 If an item appears multiple times in gamble.txt, then it is simply more likely to appear in the gamble window (but rings and amulets are special). Last I knew, people mostly wanted to gamble jewels, rings, amulets, and circlets (to roll a rare of their character level), but occasionally I wanted to gamble some set piece. a pgem only sells for 100k in hell right? As I said; determining a price for the glyph would be the most difficult thing. Its cheaper to buy adamant glyphs to reroll a coronet than gambling them. Brevan: ya I don't see why you couldn't have all the pots sold from Akara, simply because some characters tend to outgrow the pots sold at vendors, considering you can be level 20 in act 1 where a 60-100 minor health pot isn't too helpful. Also, would it be possible to code having an increase in the power of a craft (the stats) if the player decided to use multiple gems? For example you want to craft a perfect gem blood weapon, and use 2 gems instead of 1 so that you can roll higher base mods? Yes, this is possible. It's just a completely new recipe with different inputs (an extra gem) and different outputs (they just happen to look very much like the outputs of a similar recipe). The idea of rerolling a craft using only a glyph is impossible though, unless you want a glyph of every type (Basic-Emerald-craft-glyph, Exceptional-Emerald-craft-glyph, etc). I recommend keeping the input formula as it is, but simply accepting a crafted item rather than a magic item. Keep in mind that if you're mostly just having trouble rolling a great craft, you should keep your better-quality attempts for trading. Someone's better-quality craft might be perfect for you, so you can probably trade them something of similar rarity for it. Consider infecting your friend's computers with HU, so that the community grows large enough to facilitate such trading. Consider infecting your friend's computers with HU, so that the community grows large enough to facilitate such trading. What would be great is that juvs in cube were ignored while using a recipe. I'm afraid it's not possible though.